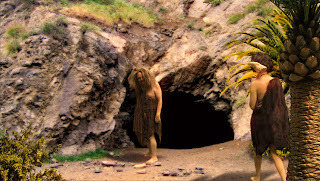 In my last post I talked about a caveman comedy, featuring two guys that were a part of a special needs people media project I worked on a couple of years ago. 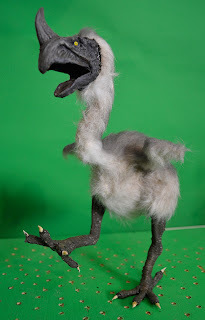 I also included a shot from the film featuring an animated character. The puppet in question is one of those terror birds, the huge flightless monster birds that appeared after the extinction of the dinosaurs. I decided early on that this film wouldn't have any dinosaurs in it, but rather primitive mammals and other creatures of that age, which are not featured very often in films. As per usual I'm using monster clay medium grade to sculpt the head, adding bits and taking away bits using loop tools. I actually can't recommend this material enough. 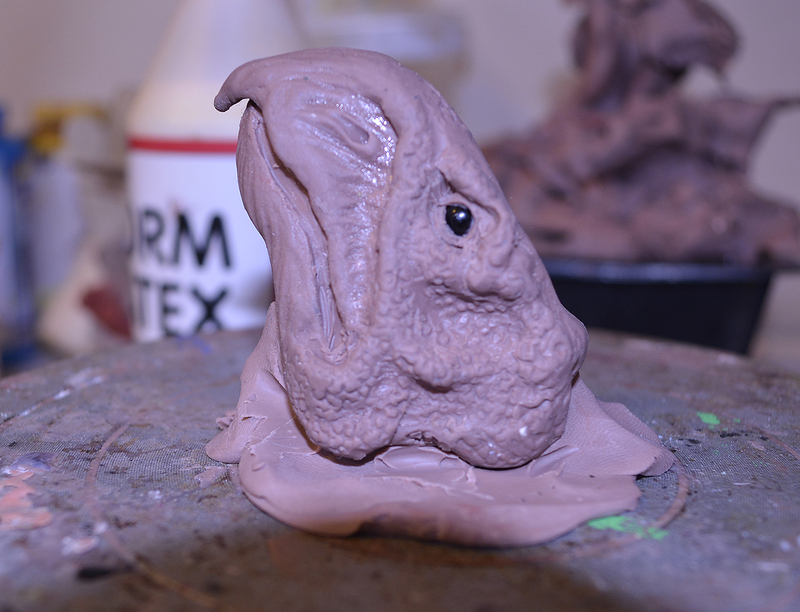 It's the most versatile sculpting material I've ever used, and works well for both small and big sculpts. 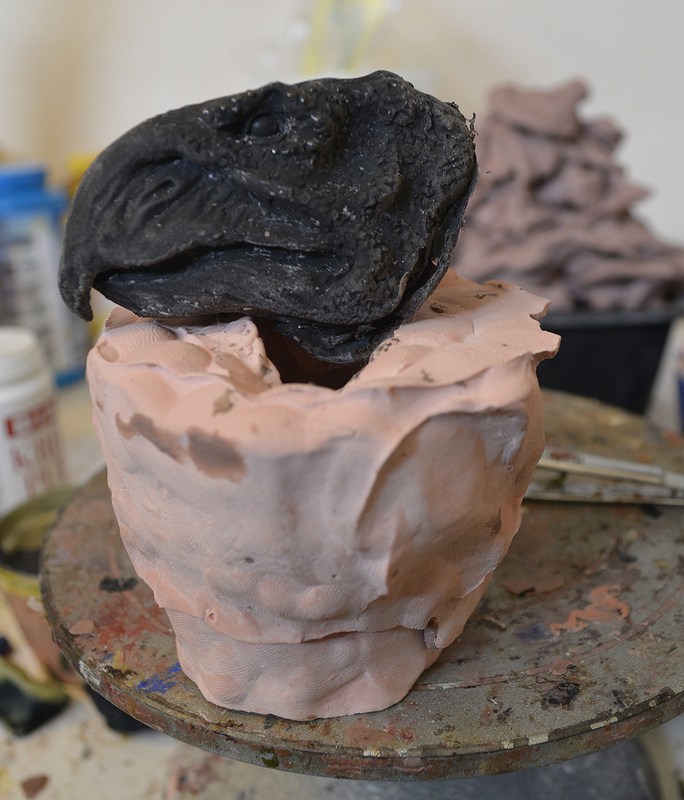 As you can hopefully see I've sculpted the mouth slightly open, and this is so I can cast the whole head, including the jaw, in one piece, having the edges of the insides of the beak slightly visible, which will create a better-looking mouth than sculpting the beak closed. Having the whole head in one piece allows me to control the overall look of it. In the case of this sculpture I've added slightly drooping corners of the mouth, which adds a permanently scowling or frowning look to the puppet. Because it's a grumpy bird! Small plastic beads stand in for the eyes. I'll simply paint on the eyes on this puppet and the glossy surface of the bead will create a smooth area in the cast latex head, which is perfect to paint eyes on. 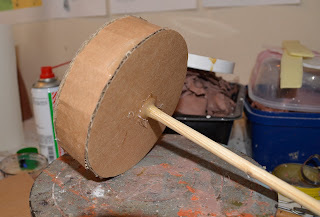 Jumping ahead a bit, I've built up a plaster mold and the clay has been cleaned out of it. I'm adding drops of tinted latex using a pipe cleaner as a brush to get the liquid into all areas of the mold. 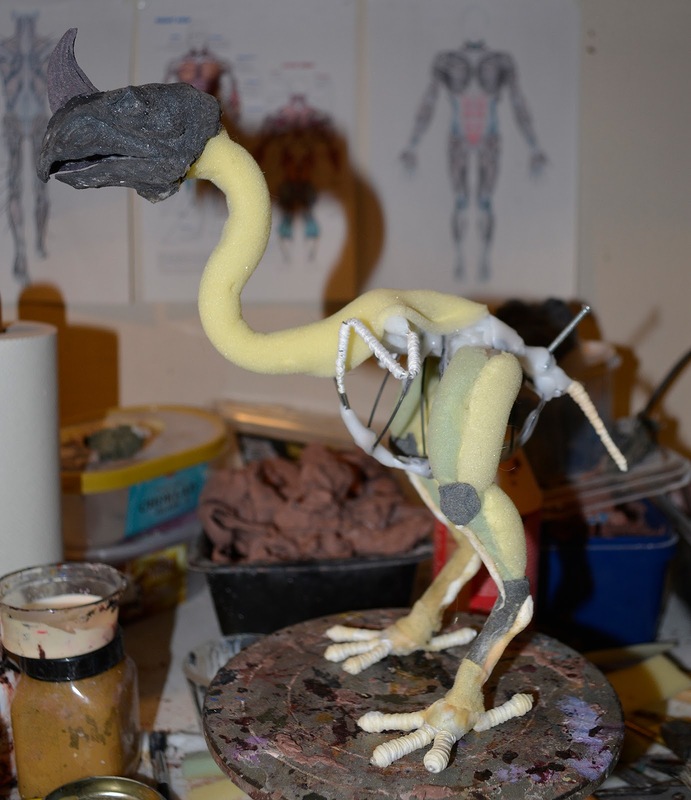 I'm adding three layers of latex, and then another layer of latex and cotton to most areas. In fact, the only parts not covered with the cotton/latex mix are the corners of the mouth. And after some pulling and prying the cast latex head skin finally comes out. I'm using a very sharp, pointy-nosed pair of scissors to cut away the excess latex in the mouth and around the head. 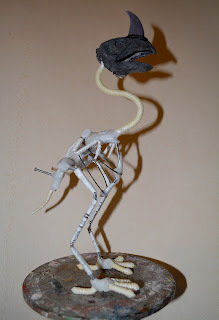 As you can see in this photo I've added a horn to the head to make the bird look even more exaggerated and primeval. 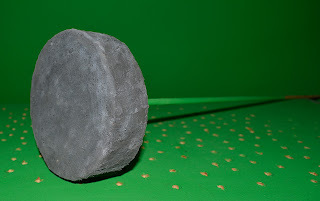 The horn was also sculpted in clay and cast as a separate latex piece. The armature is my usual bundle of aluminum wires, held together with crochet yarn and Polymorph thermoplastic. 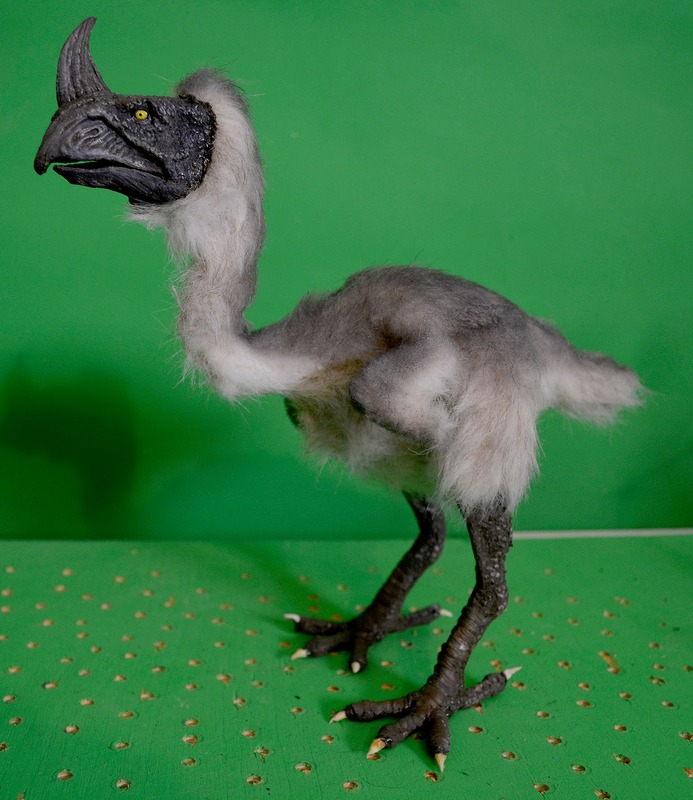 The screw at the back shows where a flying rig can be attached to make the bird jump when animated. 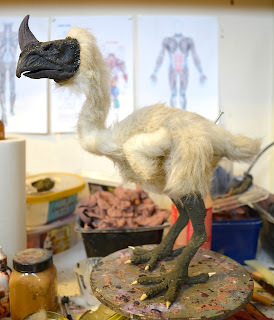 The legs and neck are covered with thin polyurethane foam, though I did remove the foam around the neck when I noticed that it would look too bulky when the "plumage" was added on top of it. This bird actually has no real feathers at all, but is instead covered by fur from an old fur hat. I figured I might just get away with that look. The finished bird puppet is airbrushed over the furry sections, but the same acrylic paint has been hand painted onto the latex parts for a more detailed look. The claws on the feet are cotton dipped in latex, and shaped by being rolled between my thumb and index finger. 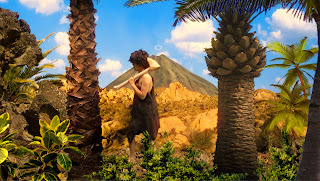 In the summer of 2016 I shot the live-action footage for a caveman comedy, which then went through extensive editing because of a faulty microphone and because I almost over-reached when I got to the FX work. But now it's finally looking like near completion, so it's time to start sharing the work on this project with you. These two happy chaps are our heroes, from left to right, Andreas Pettersson and Joakim Strömgren. They were participants in a media project aimed at people with slight disabilities, for which I worked the better part of three years. Both of them have slight mental disabilities (and Andreas is almost blind in one eye), but they're quite independent and far less glum in their outlook on life than I usually am. Eventually this project ran its course, and nobody stepped in to finance or take over it, so it quietly died. However, by this point Andreas had bought his own camera and editing software, and started making his own short videos. I wanted to stay in touch with Andreas, Joakim and others from our group, so I concocted this film to keep working with them. 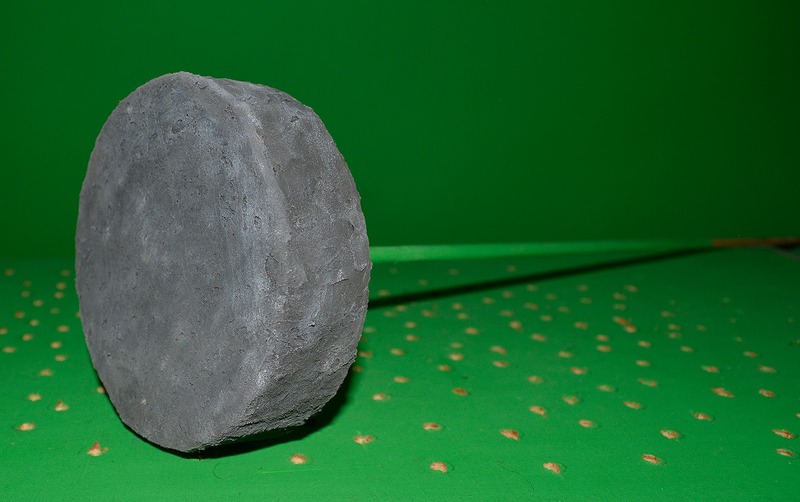 The story is basically about the invention of the wheel, and the ensuing problems. 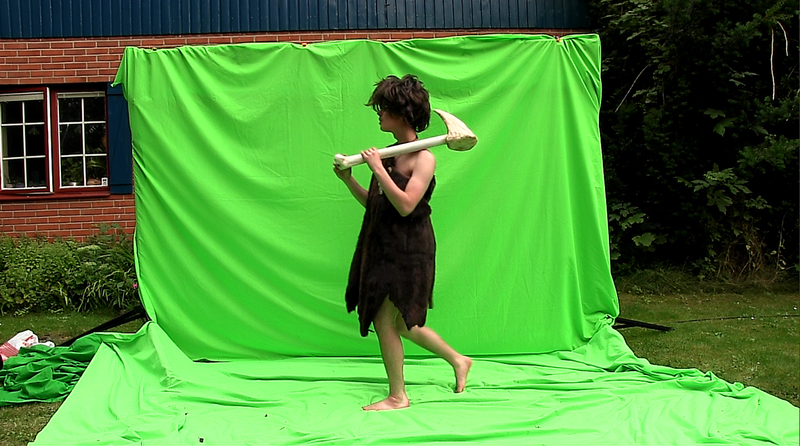 As usual I shot the whole thing in front of a green screen, but outdoors. The weather was fine up until the very last shot, after which it started to pour down. Despite using this pretty primitive set up, I'm quite happy with how the composits in After Effects turned out. All backgrounds are pieced together in Photoshop using stock images. I used a warm filter to unify the final compositions. The costumes are as plain as they can be. I bought two fur coats at a garage sale and cut them up to look like the traditional cartoon caveman garbs. 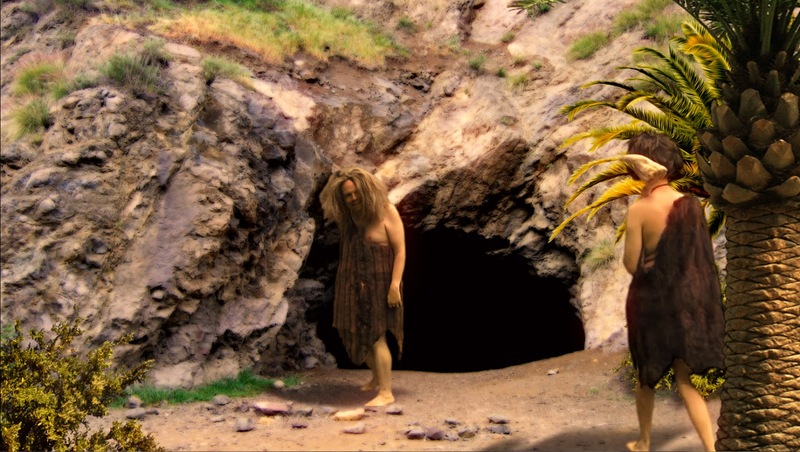 I bought three cheap wigs online (the third comes into play in one part of the story), and the other props plus some stone age jewellery were culled from previous projects. You might wonder what the heck is going on in the photo above. Well, keep reading.. This arrangement is supposed to represent the intrepid inventors trying out the wheel for the first time. Joakim and Andreas are sitting on a couple of bar stools, draped over with a green screen. Apart from the legs of the stools disappearing down holes dug by the numerous moles that infest my garden, the set up worked quite well. The actual locomotion of the venture is supposed to represent a circus act of a kind. It's not exactly a perfect effect, but the general idea seems to be communicated. Andreas right leg disappeared behind the green screened stool, so the right leg used in these shots is actually mine, shot separately and added in its own layer in AE. The wheel is a real low-tech construction: Some bits of cardboard glued together and covered with a mix of latex and cabosil, painted grey. A wooden rod is attached to the backside, and I simply spin the contraption with my fingers in front of my camera, backed by a green screen. This is what a final shot can look like. 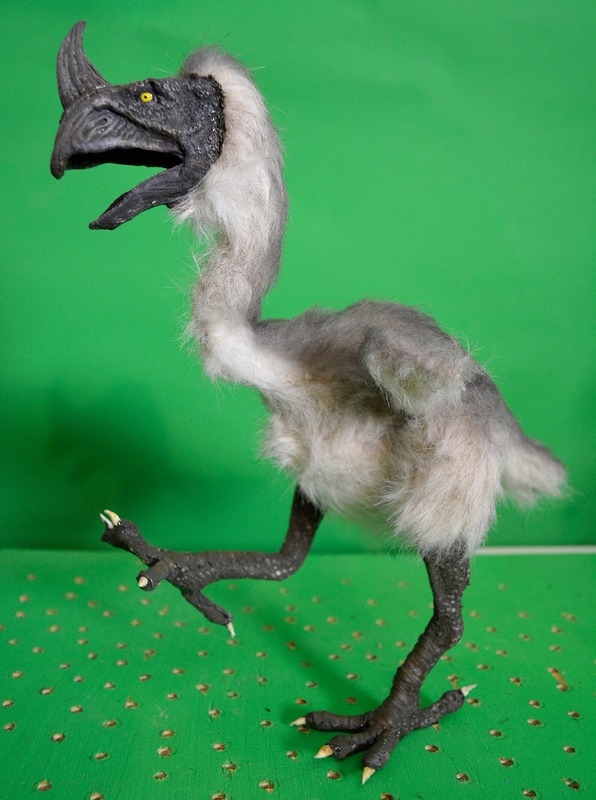 As you can see they're chased by a stop-motion bird, but there will also be other prehistoric critters in this film. No dinosaurs, though. 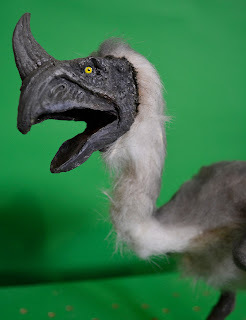 I opted for slightly cartoonish post-dino creatures instead, since they're hardly ever represented on film. 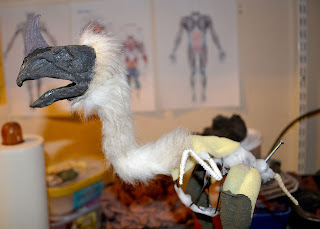 In my coming posts I'll detail the making of these puppets, as per usual. Andreas and I are actually starting up a new group project for disabled people, where we'll focus on making short films. We have some valuable support from a Swedish educational organization, and later this year I'll be reporting about our escapades there. I'm sure it won't surprise you that there'll be some stop-mo critters appearing in those videos too.